There are over 12,000 species of ant in the world. That is a lot of ants. But, thankfully, only a handful of ant species make themselves household pests. So, when it comes to distinguishing whether or not you have carpenter ants in your home, it actually comes down to only a few simple points of identification. Is it a carpenter ant or some other kind of ant? Of all the ants that you'll find crawling around your home, carpenter ants are the largest. They can be from 6 mm to 12 mm in length. But, if you need more help telling these ants apart from other pest ants, look closely between the thorax and the abdomen. Carpenter ants have a single node at their waist. This will help you to differentiate carpenter ants from two node ants, such as acrobat ants, little black ants, pharaoh ants, and pavement ants. There are other ants that have a single node, such as odorous house ants, field ants, large yellow ants, and crazy ants. If you are unable to tell the carpenter ants from these by their size, you can look at its thorax for a clue. Carpenter ants have a rounded thorax; these other ants have a thorax that is unevenly shaped. You may also be able to tell the carpenter ant by its coloring. These ants are mostly, or entirely, black. Some species will have reddish coloring. Can flying ants be carpenter ants? Flying ants are not a species of ants, but rather, a caste of ant. When an ant colony matures, it will begin to produce male and female winged reproductives. The job of these winged reproductives, often called swarmers, is to leave the nest and establish a new nest somewhere else. These swarmers will often be seen on windows and window ledges. Carpenter ant swarmers are larger than other carpenter ants, which will make them even more noticeable than swarmers of other ant species. When swarmers mate, the male ant will die and the female ant will become the queen of a new nest. When it comes to identifying carpenter ants, this is the biggest question of all. While it is certainly important to know whether or not the ants you're finding in your home are wood chewing carpenter ants or not, it is even more vital to know the difference between a carpenter ant swarmer and a termite swarmer. Most species of termite produce swarmers that have a black body, so you may be tempted to think it is a carpenter ant swarmer, but the size should be your first indication of which insect you're looking at. Termite swarmers are significantly smaller than carpenter ant swarmers. No matter what species of termite you are looking at, they will fit onto the face of a dime. Carpenter ants will be larger than a dime. If size isn't enough to tell these two insects from each other, there are a few more differences that are quite noticeable. Ant swarmers look like ants with wings. Termite swarmers do not have the distinctive waist of an ant. While both of these insects have two sets of wings, termite wings are white and stack on top of each other. Carpenter ant wings are yellowish and have a cleft between them. If you look really, really closely, you can tell them apart by their antennae. Carpenter ants have an elbow in their antennae. Termites have antennae that are straight, or have a slight curve. Whether you're finding carpenter ants or termites in your home, it is important to get a detailed inspection by a professional pest control company. Both of these wood chewing pests can do considerable damage to wood. It is never a good idea to allow them to go untreated. If you live in our New England service area, we can help. 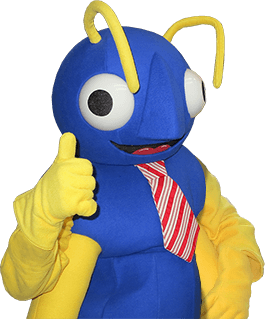 Big Blue Bug Solutions specializes in controlling wood destroying pests. Reach out to us today for more information.